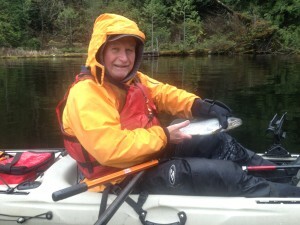 A wonderful place to spent a day on the water fishing is Sakinaw Lake located on the Sunshine Coast. This long beautiful lake is awesome to fish by kayak because the distance across is not great and there of plenty of bays and inlets to explore . 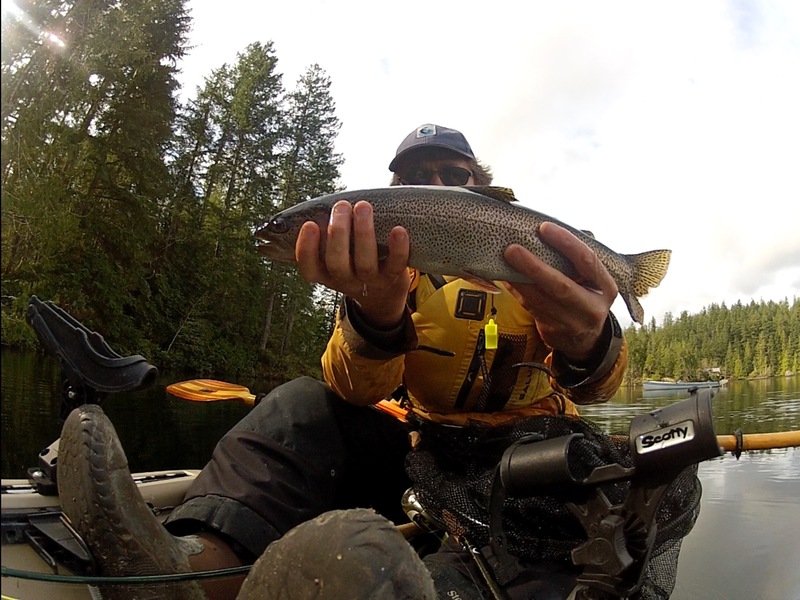 These areas provide great coverage for foraging fish and the perfect place for cutthroat to ambush an unsuspecting lure. Paddle a short distance off shore and cast a lure or fly among the fallen trees and submerged stumps. As you retrieve your hook try and watch for any movement in the water because in many instances the fish may follow the bait right to the side of the boat. 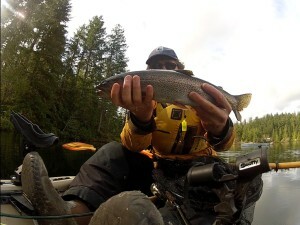 In more than one instance a trout was caught as we were drawing our hooks out of the water. A silvery flash at your lure is a dead give away that the fish is hungry and waiting for you to get your hook back into the water. Send another cast into the same area and if necessary slow your retrieved and jig the hook to entice a hit. These fish like to travel in numbers so where you find one there is usually more. 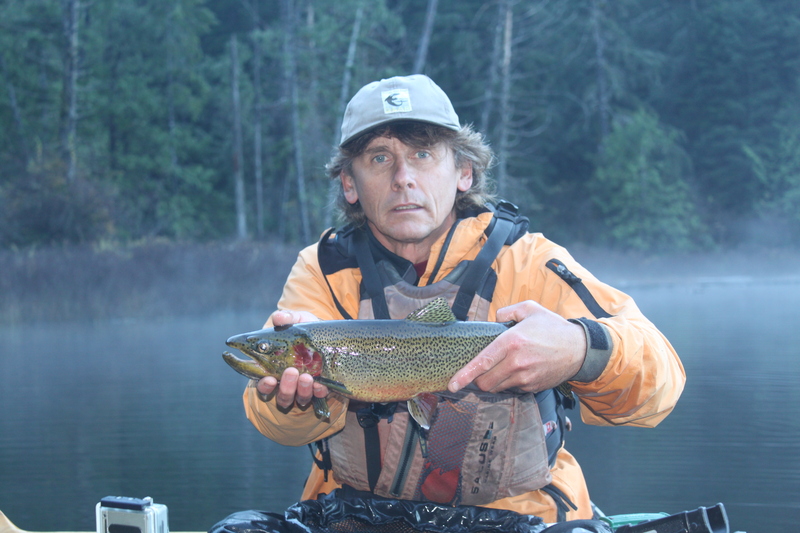 As we enter March and the warmer weather Spring cutthroat trout fishing starts to heat up. Fly patterns work well along with anything that mimics a small bait fish because these fish are highly predatory. I have had great success casting a small silver spoon into feeding areas and been rewarded with the solid tug of a fish looking for a quick meal. The cutthroat trout are starting to change colour and will have some beautiful patterns from bright silver to olive greenish gold with red on their gill plates. On the Sunshine Coast the lake fish start to spawn in the spring where you may see them migrating into small streams. Spawning usually takes place as early as February when water temperatures start to reach 6 to 8 degrees celsius or 43 to 46 degrees fahrenheit. For those us who like to kayak fish year round, and are unable to get out on the ocean because of stormy conditions, the fresh water lakes and streams offer some wonderful protected fishing that will get you hooked on cutthroat trout!